Acupuncture is a therapy that involves inserting thin needles into specific points on the body to elicit a specific reaction. 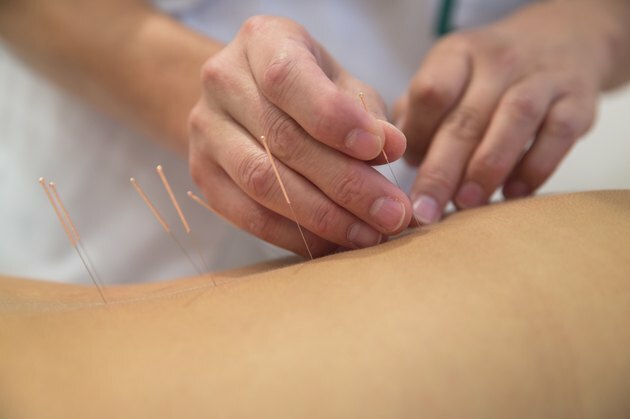 Although a variety of acupuncture styles exist, much of the acupuncture used in the United States is based on traditional Chinese medicine theory. Treating a meniscus tear would involve diagnosing the problem using TCM theory and then placing the needles in the proper points. If you choose to use acupuncture, consult with your doctor to ensure there are no conflicts with any other forms of treatment you are receiving. The meniscus is a C-shaped structure made of cartilage that is located in the knee. It protects the knee by providing shock absorption and helps lubricate the knee for smoother movement. A tear in the inner, or medial, meniscus is a common occurrence in athletes who frequently twist the knee or over-flex it. Damage to the meniscus can cause a variety of symptoms, including pain, swelling, limited movement and a clicking or grinding noises. Treatment primarily consists of reducing pain and letting the tear heal, although surgery might be performed if the tear is severe enough. The basic diagnosis for a meniscus tear, according to TCM theory, is trauma with local qi and blood stagnation. Qi is a complicated concept but basically translates to a subtle flow of energy that moves through the body while blood stagnation is comparable to a similar diagnosis in modern medicine. The acupuncture treatment for a meniscus tear would focus on moving qi and blood to decrease pain, reduce swelling and promote healing. Additional points would also be added to address any other issues that pertain to you as individual, such as a overall deficiency in the quality of the joints or cartilage. The main acupuncture points prescribed would be located around the knee, with the exact location depending on the level of pain and swelling. In many cases, the points prescribed are on a specific line that runs along the body known as a meridian, but points that are painful, tight or tender — known as ashi points — are also commonly used. Distal points, or points farther from the knee, are also prescribed, depending on the full diagnosis. Points that are commonly used include points on the liver, kidney and spleen meridians because they are intimately associated with the joints, blood and bodily fluids. Consult your doctor before beginning any type of acupuncture treatment. If you choose acupuncture treatment, visit a fully trained, licensed acupuncturist. A qualified acupuncturist might also use other modalities of treatment, such as moxibustion, cupping and massage to treat your injury. If you do have surgery for your meniscus tear, acupuncture is helpful for the recovery process and postoperative pain, according to the World Health Organization. Chinese Acupuncture and Moxibustion; Chen Xinnong, et. al.